Dr Govinda KC’s revolt against the rampant corruption and greed within Nepal’s medical sector deserves far greater praise than what he has received so far. The physician at the Tribhuvan University Institute of Medicine (IOM) is not only challenging the university, but also the government and the major political parties. KC’s fast is also a wakeup call for us ordinary Nepalis to do our best, to be honest, and to provide the best quality service to the public. However, we prefer to overlook this aspect of the doctor’s protest because that would require us to accept our weaknesses and admit that we are not performing to the highest standards. The magnitude and implications of the events of the past month have been gravely misunderstood by the Teaching Hospital, Nepal Medical College (NMC), as well as the general public. In our myopic view, nepotism and corruption is inherent only in the medical sector. Nothing could be further from the truth. Yes, the astronomical fees that medical students are charged undoubtedly invite a rather ‘visible’ and substantial degree of corruption. But every occupation in Nepal suffers from this affliction because qualities like professional integrity and excellence in the workplace are simply not valued in this country. Corruption is not only the illegal transfer of cash though. The use of political and economic power for example to appoint party apparatchiks to professional positions, is also corruption. Dr KC’s larger struggle is, therefore, not just against TU, but against political parties and leaders who abuse their influence to construct patronage networks in medical universities and elsewhere. Administrators who make their way up the professional ladder in such a deplorable manner have to pay back their ‘masters’ either in kind or cash. Heads of campuses and colleges return the favour by hiring teaching staff based on political-party membership, rather than qualification. Some of the rectors and chairmen serve as conduits through which black money is passed through. They easily admit students with ‘connections’ and provide affiliation to undeserving colleges. Supervision is reduced to nil. As a result, these officials become bereft of integrity and lose their credentials as impartial academics. They are mere pawns in a never ending political game. In most campuses under Tribhuvan University, student unions act as proxies for the political parties and have the decisive say on who is appointed to adjunct or contractual teaching faculty positions. Having gotten neither a good education nor any professional experience, the thousands of graduates that TU churns out every year are, unsurprisingly, second-rate. However, the corruption that takes place within medical colleges pales in comparison to the real cost that the country has to bear when an entire generation of qualified labour force is squandered. The political parties have spread their tentacles so wide and deep that they are stifling progress at all sectors and levels, whether it be schools and colleges, industries, businesses, or even government ministries. KC’s initiative, in this context, is admirable. But without effectively addressing the structural roots of corruption and rent seeking, the problem won’t go away just through one man’s efforts. A much larger-scale initiative with a sustainable coalition of professionals and skilled workers, school teachers, trade unions and workers, entrepreneurs, civil society, urban residents is needed to enforce true change. This is far easier said than done. 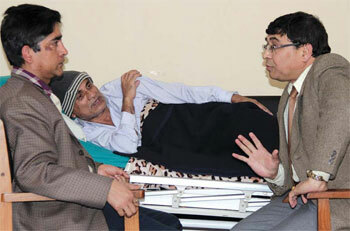 Dr Govinda KC has taken the first step, now we need to get behind him. Chaitanya Mishra is a professor at the Department of Sociology and Anthropology in Tribhuwan University.